Hi everyone. Today I'm sharing a second Christmas card I made for Merry Monday Challenge #211 - Blue, Gold, White / Silver. I experimented with liquid pearls after seeing this awesome post by my friend, Maria (reislingmama). Seriously this girl always comes up with wonderful new ways to use a product. Maria used the technique to make her background for her card. I decided to make it my focal point. I followed her technique, first adding pearl drops to my card front, then spread with my fingers. Then I added a bit of gold liquid pearls, again, spreading with my fingers. I wanted to add blue, but didn't have that colour, so made my own by combining the pearl (white) liquid pearl with some peacock feathers re-inker. It mixed really well and I ended up with a very saturated colour of turquoise, which was spread on top, along with a few drops of silver glitter glue. 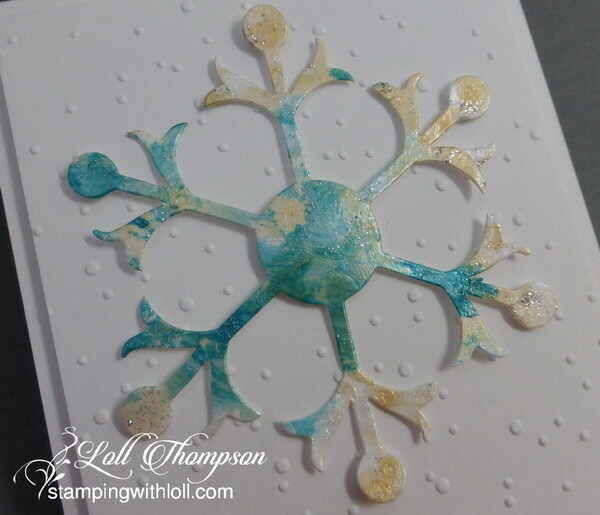 :) I dried my card front with my heat tool, and then die-cut the large snowflake from Stampin' Up! Happy with my experiment ... thanks again Maria for such a fun idea! I popped up the snowflake over a snow embossed background (embossing folder borrowed from my friend Susan, so I don't know the name). Then stamped the sentiment onto a strip of card stock and adhered along the bottom. I'm including a close up pic you can see the shimmer and sparkle from the liquid pearls and glitter glue ... along with some great texture. Labels: christmas, dry embossing, Stampin' Up! This is beautiful! Such pretty colors. I´ll have to try this. Thanks for the inspiration. OMG - your snowflake looks amazing, Loll! So gorgeous with the embossed background behind! Never thought to use Liquid Pearls as background...awesome technique...of course, gotta try!!! Beautiful snowflake, Loll. And, to use reinkers to color the silver!!!! Wow! Oh this is gorgeous Loll. The colors are beautiful. Great technique. love that technique and you achieved such gorgeous colors - wonderful card, Loll! Oooh this is so pretty Loll! That technique is fabulous. This experiment turned out beautifully, Loll! What a gorgeous snowflake! And it's so perfect on that snowy background! Thanks for sharing with us again at Merry Monday! Love the snowflake Loll, great technique beautiful CAS design. Thanks for sharing at Merry Monday. Love this stunning snowflake Loll - it is stunning!! That snowflake looks absolutely amazing, Loll!!! WOW, how beautiful!!! Such a wonderful CAS design!!! Hope you enjoyed a Happy Canada Day. I am super busy with my little ones, have a new baby starting today. She is a sister of one of my other kids. It will keep me hopping. Thanks so very much for the visit to my blog. Totally love this design! Have the SU Snowflake Bigz Die but haven't used it in awhile. Going to pull it out and Case this card subbing inkas since I don't have liquid pearls. Will make a few to add to my stash. Great looking card. How lovely mix all the colors! And how beautifully together they look! Wonderful creation. Well, your experiment was a success! That snowflake looks stunning! I think I have only white liquid pearls, so it's good to know I can dye it! Thank you! Love this gorgeous card. The colors are stunning and I'm so glad you shared it today. The snowflake is amazing! So beautiful! And perfect against the (my) embossing folder! Ha! That looks familiar ;) Isn't it a gorgeous effect? Especially since we're not doing pearls on cards anymore ;) Love that white can become any color. Must remember that. Wow Loll, you have been trying some really great and fun techniques recently which I have missed because I have been on holiday and am trying to catch up. This is fabulous, and I so love the colours!! This is gorgeous, Loll! I was on vacation and am working on catching up with posts. I will come back to this one to figure out how you created this. Simply stunning! Ohh my goodness Loll this is so pretty. Love that die cut and the colours on it.